The article below from The Sydney Morning Herald is an interesting overview of the Second Vatican Council and its aftermath. Those of us just old enough to remember the Church before "the tornado," can recall our local parish church offering hourly Masses on Sunday mornings, with one of the four or five priests assigned to the parish saying Mass for the overflow crowds in the parish school gymnasium, while latecomers stood outside the church's front entrance because there was no room inside. We remember schools fully staffed by religious sisters and brothers. We remember the beauty of May devotions around a lovely grotto at our Xaverian Brothers' school, where every evening, during the month of May, we prayed the Litany of Loretto, recited the Holy Rosary and sang Marian hymns. We remember the long lines for Confession on Saturday afternoon and the awesome solemnity of Benediction on Sunday afternoon. We remember too, that within a few years of "the tornado," the number of Xaverian Brothers was halved and their numbers have declined ever since. The school campus, a military school patterned on Annapolis, with 100 year old traditions, was sold to the county government. In high school where the word "Catholic" was never mentioned but replaced by "Christian," we dedicated ourselves not to learning doctrine, the Church Fathers, theology, Sacred Tradition and Scripture, but to the work of collage making. The professed religious we loved and admired left the religious life in huge numbers after the end of each school year. Every Catholic family has been affected by it, every funeral and wedding is a reminder of loved ones who no longer practice the Faith. The calamity, whose fiftieth anniversary the Church will celebrate next month, was like an Emperor's triumphal procession; many cheered and celebrated, but others felt for decades like the defeated army being marched in review. Thanks be to God for our present Pope and his predecessor for beginning the work of restoration, for restoring the beauty, joy and confidence we knew before the cold winds blew. While much wreckage remains, the Church is beginning to look outward again. There is desperate need for Her salvific mission in our families, our country and around the world. The Vatican II council, which began 50 years ago next month, was the most momentous religious event in 450 years. 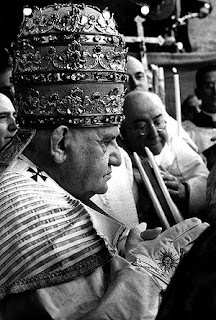 ON JANUARY 25, 1959, the newly elected Pope John XXIII invited 18 cardinals from the Vatican bureaucracy to attend a service at the Basilica of St Paul Outside the Walls in Rome. He told them he planned to summon a global church council. The horrified cardinals were speechless, which the Pope mischievously chose to interpret as devout assent. But, in reality, the Vatican bureaucrats, known as the Curia, were aghast. The Pope, 77, had been elected purely as a caretaker, but here he was indulging a novel, unpredictable, dangerous and, above all, they believed, unnecessary notion. In their view it would create ungovernable expectations and might even lead to changes. And if there were to be changes - always undesirable - then the Curia would manage them without any outside intervention, as they had for centuries. They regrouped and fought back. If they could not avoid the council, then they would control it. They proposed 10 commissions controlled by Curia members to run the council, which would discuss 70 documents prepared by the Curia. Everything was designed to reinforce the status quo. But the world's bishops, led by a generation of outstanding European theologians, were in no mood to submit. They simply sidestepped the careful preparation and arranged their own agendas. The Curia were right to worry. What Pope John unleashed, now known as Vatican II, was the most momentous religious event since Martin Luther launched the Protestant Reformation 450 years earlier. The winds of change proved more like a tornado, leaving almost nothing untouched. It is difficult for people under 60 to grasp how radical, how wide-ranging and how deep the effects were because they do not remember the church as it was before the council - ''frozen in a time warp'', as Jesuit priest Gerald O'Collins told The Age. Pope John intended the church to emerge from behind the battlements, lower the drawbridge and engage with the modern world. The most obvious and visible change for Catholics in the pew was worship in their own language rather than in Latin, with the priest now facing them rather than the altar, plus an affirmation of the role of laypeople. But there were other profound developments such as a willingness to engage with other churches, even other faiths, a renewed focus on social justice, and a decentralised approach to authority in the church. Today, as religious culture wars between traditionalists and progressives rack the church in the West, Vatican II has become the key battlefield. Both sides want to define and control the council's legacy. Progressives accuse traditionalists, who have had the huge political advantage of having the past two Popes among their number, of trying to wind back the liberalising reforms by stifling important debates and reimposing a strict top-down control of both practice and belief. Traditionalists counter that progressives want the church to conform to the ever-changing spirit of the times. ''Ratzinger (Pope Benedict XVI) has said they treated the church as if it were a haberdashery shop that has to update its window with the arrival of every new fashion season,'' says theologian Tracey Rowland, dean of Melbourne's John Paul II Institute for Marriage and Family. Others found the council and its fruits inspirational. For Bob Dixon, a teenager in Ballarat in the late 1960s, it connected his faith with the world. He was a child of the pre-Vatican II church, with its fixed certainties and emphasis on sin and grace, now often condemned as a fear-based approach to religion. ''But I suddenly began to see that faith was about life and the world and society and social justice,'' says Dixon, now one of the Australian church's most important laypeople in his position as head of the national Pastoral Projects Office. Young Australian priests who were in Rome for some of the sessions, such as George Pell - now Cardinal Pell, Archbishop of Sydney - and Michael Costigan, who began his later career as a journalist by posting home reports, were swept up in the enthusiasm. At the time, Costigan remembers, it was not only the Curia who doubted the need for a council. Things seemed pretty good: the seminaries were full and so were the churches. But the whole world was about to tilt on its axis. As Dixon observes, the council came at a time of huge social change: the rise of feminism, the sexual revolution, the shifting focus from community to individualism, a different attitude to authority and vastly greater opportunities for education. ''It happened just in time to enable the Australian church to ride out that turbulent time in the 1960s and '70s,'' he says. THE council met in four sessions from 1962 to 1965, and produced 16 documents, each a treatise - a manifesto, even - setting out the church's thinking and future direction in a specific area. Where before the church's official position was that all other churches were in schism and must return to Rome, the new stance emphasised dialogue and reconciliation. On other religions, the church for the first time welcomed what was ''good and true'' in them. There was a renewed emphasis on social justice as part of the Christian life alongside personal piety, and laypeople were explicitly recognised as having a central role in the mission of the church. Vatican authority was reduced in favour of a greater autonomy for local bishops and a more collegial approach. Pell identifies as particular advances the greater leadership role for bishops and also laypeople, whether on parish councils or church schools or welfare agencies. For Gerald O'Collins, back in Melbourne after 32 years teaching at Rome's Gregorian University - where he taught what are effectively a fifth of today's bishops and a third of the cardinals - the most important advances involved other religions and social justice. ''No council until [Vatican II] ever said a nice thing about Jews, Muslims or Buddhists. I can't tell you how much I welcomed the very short document on other religions. The increasing involvement of laypeople may have made the church's leadership uncomfortable, says Sydney theologian Neil Ormerod, but they have had to come to terms with it. Even theological education is increasingly in the hands of laypeople like himself. Over the half-century since Vatican II, the church hierarchy has wound back many of these radical changes, believing they have gone too far. This has led to the modern culture wars over such issues as authority and democracy, celibacy and married priests, the role of women and issues of sexuality. A recent example is the introduction of new English texts for worship, reinforcing the Vatican view of what worship should be, an imposition resented by many. Progressives admit their cause is in decline at the Vatican, largely because the Pope appoints the bishops, and the last two Popes, covering 34 years, have been careful to favour conservatives who won't rock the boat. The progressives say the real life of the church is in the parishes (and welfare agencies), and that the bishops and even the Pope are largely unseen and irrelevant. Conservatives in contrast tend to look to Rome as custodian of Catholic belief and practice. Robert Blair Kaiser, who covered the council for Time magazine, suggests that ''rather than whine over what daddy won't let us do'', Catholics should be grateful for what the council did achieve, and build on that themselves. Barney Zwartz is The Sydney Morning Herald religion editor. "Things seemed pretty good: the seminaries were full and so were the churches." I remember it well. The Pope opened the door a crack and the revisionists drove a bus through it.